LIQUI-MOLY Bathurst 12 Hour winners Ferrari has continued their strong form at the pointy-end of the GT3 pack, grabbing pole position for the Spa 24 Hour this weekend in Belgium. It’s the first time since the Total 24 Hours of Spa have been part of the Blancpain GT Series that a Ferrari will start from pole position. 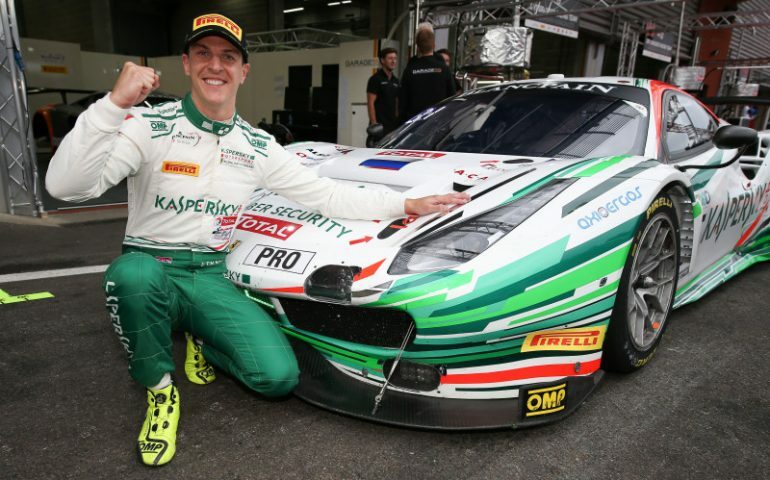 James Calado clocked a superb 2m17.390, the fastest-ever lap of a GT3 car on the Spa track, at the wheel of the #55 Kaspersky Motorsport Ferrari. Mirko Bortolotti (#63 Grasser Racing Team Lamborghini) will be next to him on the front row, with Belgian drivers Frédéric Vervisch (#2 Audi Sport Team WRT R8) and Laurens Vanthoor (#117 KÜS Team75 Bernhard Porsche) sharing the second row. This was quickly confirmed by René Rast (#1 Audi Sport Team WRT R8) and Laurens Vanthoor in the KÜS Team75 Bernhard Porsche, who both broke the 2m18-barrier. The Belgian’s time was 0.052 quicker than Rast’s, but the German did not stay second for long. The Spa 24 Hour gets underway tonight, Australian time, with coverage details available via the Blancpain GT Series website.